To get the best protection for your roof on heavy rainfall try our Original Liquid Applied Rubber Roof Paint. We are a cooperative of manufacturing and Contracting Service and gaurantee the products stated performance. Welcome to Best Roof Paint. 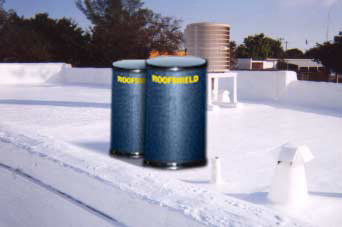 Our Roofprotect Product can withstand ponding water situations because of its superior design. Roof Painting and coating applicators in Fort Lauderdale, Lauderdale by the sea, Broward County Florida, is "The Original liquid Applied Rubber Roof Shield ," the genuine trademarked rubberized 100% acylic roof paint coatings, roof tile sealers and commercial flat roof paint products are weatherproof, waterproof, mildew resistant and energy efficent. The quality which makes our customers so satisfied and happy is that "Our Roofprotect Product, which withstands ponding water situations because of its superior design." And all this was possible through the utilization of proprietary manufacturing technology, this unique process produces a true High-Performance liquid Rubber Acrylic Paint Product without water, fillers, thickeners or extenders. The Original Liquid Applied Rubber coating has been used successfully on many different substrates and subjected to severe conditions ranging from the tropical to the freezing north. Our trademarked World Class Rubber can restore, protect and preserve any clean, dry, and stable surface: Concrete, Barrel, Flat, or S - Tile, Metal, Gravel, and Foam. From Roofs, Walls, Decks and much more. It withstands to ponding water. It has good weathering capabilities. And lastly, "Roof leak repair contractors" - Some of our local experts who are roof repairing contractors of leaking roofs, have specialized training in handling all types of roofs, even the complex and the unique metal roof repair, which is considered as "Best Roof Paint and Coatingsâ€� because of the unique premium materials which they trust and it contains the latest advancements in weathering, wind resistance, fire safety and durability.